Just when you thought that, for better or worse, Graco couldn’t possibly produce anything to fill an empty space in the flooded baby market, they’ve done it. And ladies and gentlemen, the joke is on us. Graco has always been the base for the big box market, shelling out millions of baby products that do the job but with no added bells, whistles, and definitely nothing close to innovative. There are definite advantages to their system; parents always know exactly what to expect, items are easy to use, and of course the price is the best considering that you can usually get a fair amount of use from a Graco. However, the marriage of Mr. Functional Baby to Mrs. Post Modern Organica (nee Classica Design) changed the market completeley. Moms started to be their own manufacturers and would not be talked down to by corporations who thought they knew what was best for the children. Smaller companies became big names in the industry by staying at the cutting edge of new fashion and comfort. Ironically, as people started to have fewer children, the money funneling into the baby industry was increasing as each new Mom’s pregnancy (forget about the actual birth!) started to become the Hallmark event of the year for any and every person within a 400 mile radius. The bright lights-big city- sensory overloading-Mattel-Cosco-Graco deal would just not cut it any longer for the newest generation of Moms. Impressively enough, the enormous Gentle Giant that is Graco collected the strength to shift with the rapidly changing market. 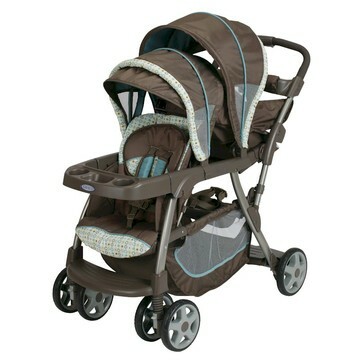 Before coming out with this new Sit and Stand/Twin Double Graco was the first to put out an infant seat with a belt securing buckled base. Car seat techs bowed their heads gratefully but insisted it was a fluke coming from Graco. Retrospectively though, it seems that Graco is not simply resting on their tremendous laurels and the security net of their big box customers. G raco Ready2Grow Stand and Ride Stroller is an entirely different (albeit similar to other products) item that fills a void for Moms who need a decent double stroller on a budget. Choices of doubles have always been limited since it’s obviously more difficult to create a sleek and functional two seater but Graco seems to have done a fine job with their latest. 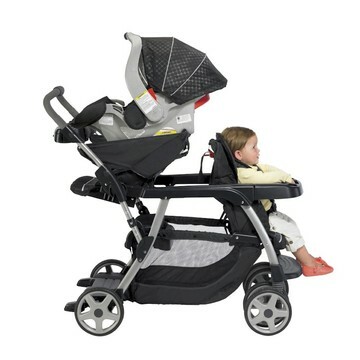 The Ready2Grow has 12 different configurations including sit and stand, two car seats, or two toddlers. Unlike any other sit and stand, it has an option to add or remove the second seat and have just a bench which makes it more compact and of course, lightweight. For more details on the Ready2Grow click on the link below!